Geothermal energy is the heat that originates within the earth. It is the thermal energy contained in the rock and fluid (that fills the fractures and pores within the rock) in the earth’s crust. Many of the large-scale geological processes that have helped to form the earth’s surface features are powered by the flow of heat from inner regions of higher temperature to outer regions of lower temperature. Generation of new oceanic crust at spreading centers such as the mid-Atlantic ridge, motion of the great lithosphere plates, uplifting of mountain ranges, release of stored strain energy by earthquakes and eruption of volcanoes are all powered by the outward transport of internal heat. Plastic, partially molten rock is postulated to exist everywhere beneath the earth’s surface at depths of 100 km (60 mi) or less. By comparison, using present technology applied under favorable circumstances, holes can be drilled to depths of about 10 km (6.2 mi), where temperatures range upward from about 150°C (300°F) in average areas to perhaps 600°C (1,100°F) in exceptional areas. Exploitable geothermal resources originate from transport of heat to the surface through several geological and hydrological processes. Geothermal resources commonly have three components: 1) a heat source, 2) relatively high permeability reservoir rock, and 3) water to transfer the heat. In general, the heat source for most of the high-temperature resources (>150°C [300°F]) appears to be a molten or recently solidified intrusion, whereas many of the low-temperature (<100°C [212°F]) and moderate-temperature resources (between 100° and 150°C [212° and 300°F]) seem to result from deep circulation of meteoric water with heating due to the normal increase in temperature with depth. A number of high-temperature resources also occur in the Basin and Range Province of the western U.S. as the result of deep circulation along major faults in a region of high heat flow. In most geothermal systems, fracture permeability controls water movement, but inter-granular permeability is also important in some systems. Water is, of course, the ideal heat transfer fluid because it has a high heat capacity and high heat of vaporization, and can therefore transport more heat per unit volume that any other common fluid. A free convective circulating system is set up with the heated water ascending in the center of the system along zones of permeability, spreading outward in the shallow subsurface or discharging to the surface, and with cool water descending along the margins and recharging the system. Rapid convection produces nearly uniform temperatures over large volumes of the reservoir. With few exceptions, the higher temperature geothermal areas in Utah occur either in the Basin and Range Province or within the Basin and Range-Colorado Plateau transition zone. In central and western Utah, most thermal areas are located in valleys near the margins of mountain blocks, and are probably controlled by active basin-and-range faults. Other geothermal systems occur in hydrologic discharge zones at the bottom of valleys. A few thermal areas are situated in mountainous regions. The most significant known occurrence of geothermal water in eastern Utah is from oil wells of the Ashley Valley oil field, which yield large volumes of nearly fresh water at temperatures between 43°C and 55°C (109°F and 131°F) as a byproduct of oil production. In 1981, the Ashley Valley field yielded 5.42 million m3 (26.1 million barrels) of water. Known high-temperature systems include the Roosevelt Hot Springs and Cove Fort-Sulphurdale Known Geothermal Resource Areas (KGRA). KGRA is a federal classification pertaining to geothermal areas where federal lands have competing leasing interests. Other potential high-temperature systems are Thermo Hot Springs, Joseph Hot Springs, the Newcastle area, and the Monroe-Red Hill area. In and around the Sevier, Black Rock, and Escalante Deserts in southwestern Utah, a number of geothermal systems have estimated reservoir temperatures greater than 100°C (212°F). Electric power has been generated at the Roosevelt Hot Springs and the Cove Fort-Sulphurdale Known Geothermal Resource Areas (KGRA) in Beaver County since 1984. The Cove Fort-Sulphurdale facilities are currently shut down, but the new developers (Enel North America) are currently drilling additional wells, anticipating building new geothermal power generation. Recently (2008) the Blundell plant at the Roosevelt Hot Springs KGRA was expanded from 26 MW (gross) by the addition of an 11 MW binary power generation unit. Also, new geothermal power generation has come on-line at the Thermo Hot Springs geothermal area southwest of Minersville, also in Beaver County. Raser Technologies began production from the 10 MW Hatch geothermal plant in 2008 at Thermo Hot Springs. Commercial greenhouses, using thermal water for space heating, operate at Newcastle in Iron County, Crystal (Bluffdale) Hot Springs near Bluffdale in Salt Lake County, and Utah Hot Springs in Weber County. Nine resorts use geothermal water for the heating of swimming pools, small space-heating applications, and therapeutic baths. Direct-use geothermal developments consisting of commercial scuba diving and aquaculture include facilities at Bonneville Seabase, Tooele County, Mystic Hot Springs Resort, Sevier County, Belmont Hot Springs Resort, Box Elder County, and Hi-Tech Fisheries, Salt Lake County. The Utah Department of Corrections also uses geothermal water for space and domestic water heating for 332,000 square feet of the Utah State Prison, Salt Lake County. Utah Power, a PacifiCorp company that merged with Scottish Power in 1999 and later was purchased by Mid-America Energy in 2005 has operated the single-flash, Blundell geothermal power station at the Roosevelt Hot Springs geothermal area near Milford in Beaver County since 1984. Utah Power produces geothermal brine for the Blundell plant from wells that tap a geothermal resource in fractured, crystalline rock. The resource depths range generally between 640 and 1,830 m (2,100 and 6,000 ft). Resource temperatures in production wells usually exceed 271°C (520°F). Wellhead separators are used to “flash” the geothermal fluid into liquid and vapor phases. The vapor phase, or steam fraction, is collected from the production wells and directed into the power plant at temperatures between 177 and 204°C (350 and 400°F) with steam pressure approaching 7.66 kilograms per square centimeter (109 psi). The liquid phase, or geothermal brine, is diverted to a new, binary power unit, after which the spent fluid is channeled back into the reservoir through gravity-fed injection wells. The plant produces 26 MWe gross (23 MWe net) from the single-flash unit, and an additional 11 MWe (rated capacity) from the binary power unit. Raser Technologies began drilling geothermal exploratory wells at this known, but relatively unexplored, geothermal area about 16 km (10 mi) southwest of Minersville in Beaver County in November 2007. As of July 2009, Raser had completed 10 wells to depths approaching 2133 m (7000 ft). Bottom-hole temperatures measured in all wells are near 177oC (350oF). This drilling program facilitated the development of the Hatch geothermal power plant. The plant consists of a rapid deployment design utilizing 50 binary power units, built by United Technologies, each with a capacity of 250 kWe, coupled to a water cooling system. The net output of the Hatch plant is estimated between 10 and 11 MWe. Raser currently (2009) has a power purchase agreement with the City of Anaheim, California. At Sulphurdale, Beaver County in 1985, Mother Earth Industries, in cooperation with the city of Provo, installed a geothermal binary-cycle power system and a steam-turbine generator. In 1990, Provo and the Utah Municipal Power Agency dedicated the Bonnett geothermal power plant, which became the third geothermal power facility to go on-line at Sulphurdale to provide electricity for Provo. In 2003, Amp Resources acquired the Sulphurdale geothermal properties. Amp shut down the operation, with plans to reconstruct the facility and eventually build a 30 to 40 MWe binary power plant. 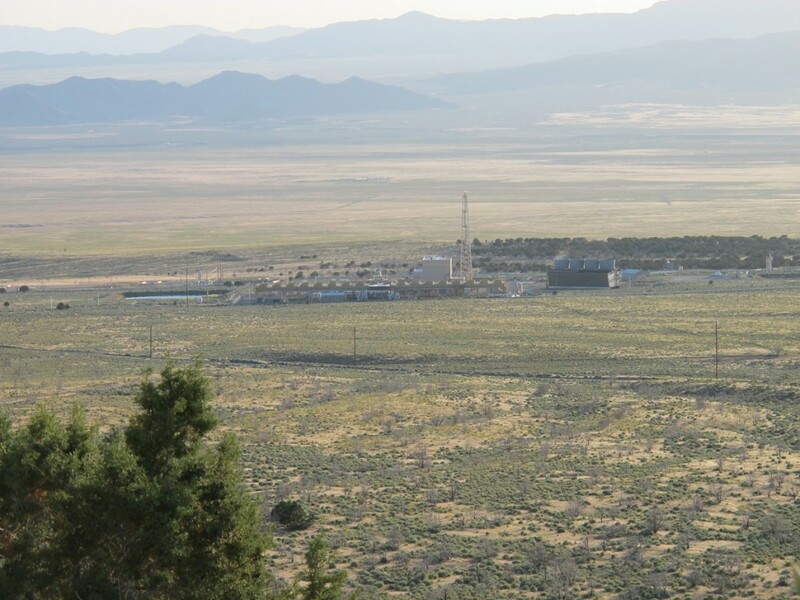 In 2007, Enel North America acquired the project along with a number of other geothermal ventures in Nevada and California. Enel is currently (2009) drilling new wells, performing environmental assessments and geoscience investigations, in anticipation of constructing a new geothermal power generating facility. Production wells primarily tap a shallow, vapor-dominated part of the geothermal system at depths between 335 and 366 m (1,100 and 1,200 ft). Deeper wells, however, reportedly will tap an underlying liquid-dominated part of the system. Various research organizations and energy companies became interested in the Newcastle area of Iron County in the 1970s after farmers accidentally discovered a relatively shallow hydrothermal system while drilling irrigation wells. One well encountered a hot-water aquifer with a maximum temperature of 108°C (226°F) between depths of 75 and 94 m (245 and 310 ft). Subsequent studies by the UGS suggest a model of hot water rising along a mountain range-bounding fault and discharging into an aquifer in unconsolidated Quaternary sediments, forming a broad outflow plume. Temperatures within the outflow plume generally range between 82° and 104°C (180° and 220°F). Two commercial greenhouses operators (Castlevalley Greenhouses and Milgro Newcastle, Inc.) use the geothermal fluid from shallow production wells (152 m [500 ft] deep) to heat four greenhouse complexes that produce high-quality flowers, vegetables, and ornamental plants year-round. All four of these complexes are clustered together above the geothermal outflow plume at Newcastle. Milgro Newcastle, Inc. may be among the most successful companies using commercial applications of geothermal water for space heating in the United States. Milgro’s greenhouses are now the nation’s largest producer of chrysanthemums, and also one of the nation’s largest growers of flower bulbs, after having produced no bulbs prior to their Newcastle development. Milgro’s total greenhouse space at Newcastle is about 102,200 m2 (1.1 million ft2). Castlevalley Greenhouses consists of nine arched, double plastic covered buildings. The main crop is tomatoes grown hydroponically. These are marketed by the owners throughout southern Utah. A few bedding plants are also grown. Castlevalley Greenhouses completed a 4600-m2 (49,500-ft2) addition in 2006 of geothermal-heated greenhouse space for a total of 8360 m2 (90,000 ft2). Crystal (Bluffdale) Hot Springs is located at the southern end of the Salt Lake Valley where Bluffdale Flower Growers (formerly Utah Roses) operates a geothermal-heated greenhouse complex. Bluffdale Flowers’ facility is located adjacent to the Utah State Prison (see “Space Heating” for more information on the Utah State Prison geothermal heating system). Bluffdale Flowers’ facility produces cut roses as its primary product, covering about 2.3 hectares (5.7 acres). In September 2009, the operators reported they were drilling two additional wells (one production and one injection) in order to expand operations by an additional 0.9 hectares (2.3 acres), that would bring the total area under cover to about 3.3 hectares (8.0 acres or 350,000 ft2) (Jack Kaleel, verbal communication, 9/15/09). Surface spring temperatures are about 62°C (144°F). Subsurface temperatures of 88°C (190°F) have been reported in one of two 122-m (400-ft) deep production wells. The springs normally issue from valley alluvium into several ponds. Utah Hot Springs issue from several orifices in valley fill sediments at the western edge of the Pleasant View spur about 90 m (300 ft) west of U.S. 89 on the Box Elder-Weber County line. The area is within an urban-industrial setting adjacent to a utility corridor, highway, and Interstate 15. The springs presently flow under the railroad and across a gentle slope. The springs are currently used to heat a small commercial greenhouse run by the Allan Plant Company. The maximum water temperature reported is 63°C (145°F); although, temperatures reported in most studies ranged between 57°C and 58.5°C (135°F and 137°F). A total of 24 double plastic covered greenhouses are heated with the geothermal water year-round. These greenhouses are used to raise bedding plants (mainly geraniums) and poinsettias, which are sold wholesale to garden centers throughout northern Utah. Because of the high iron content in the water, special fittings are provided at intervals from the bottom of the heating pipes. These are flushed out with a hose three or four times a year. The hot springs were on the Hensley/Salt Lake Cutoff emigrant trail used in the 1850s. At the turn of the century, a resort with a geothermally heated pool was built. Special trains were run from Salt Lake City and Ogden to the resort while it was in use. The resort was torn down about 1970; however two cisterns remain that were used to collect the spring water. Bonneville Seabase is a scuba diving facility developed at Grantsville Warm Springs located about 66 km (40 mi) west of Salt Lake City along Interstate Highway 80 in Tooele County. Seabase consists of several dive pools fed by warm springs and stocked with tropical marine fish. The facility is associated with Neptune Divers of Salt Lake City, a business devoted to scuba diving and related-product sales. Low-temperature thermal waters are present in the western part of the Great Salt Lake Desert, as recorded in wells used for brine production and mineral extraction around the Bonneville Salt Flats, and as thermal springs at Blue Lake and Salt Spring. Blue Lake and Salt Spring, located in western Tooele County near the Utah-Nevada border, are small lakes fed by thermal springs. Although the temperatures of the spring vents located beneath Blue Lake are not known, the temperature of Blue Lake is fairly constant at about 29°C (84°F). The area, which includes a small parcel of private land, adjacent to a state wildlife preserve, both enclosed by a military reservation, is valuable for the recreational opportunities offered in the form of year-round scuba diving and as a wildlife habitat. At Belmont (Udy) Hot Springs in northeastern Box Elder County, about 50 hot springs and seeps issue along the Malad River at about 52°C (125°F). In addition to a golf course and camping facilities, the Camperworld resort has therapeutic hot tubs, a swimming pool, and a scuba diving pool. The dive pool is also used to heat four homes through black plastic pipes submerged in the pool. Crystal (Madsen) Hot Springs Resort, near Honeyville along Interstate Highway 15 in Box Elder County, uses cold springs and hot springs at the same facility. The springs are situated along the northern extension of the Wasatch fault, which traverses the western side of the Wellsville Mountains. A cold spring (11°C [52°F]) is used to help fill a 1.1-million-liter (300,000 gallon) pool, while hot springs 60°C (140°F) fill therapeutic hot tubs, mineral pools, and also flow into the swimming pool. The warmer pools’ temperatures range from 29° to 44°C (85° to 112°F), while the large swimming pool is kept at about 21°C (70°F). 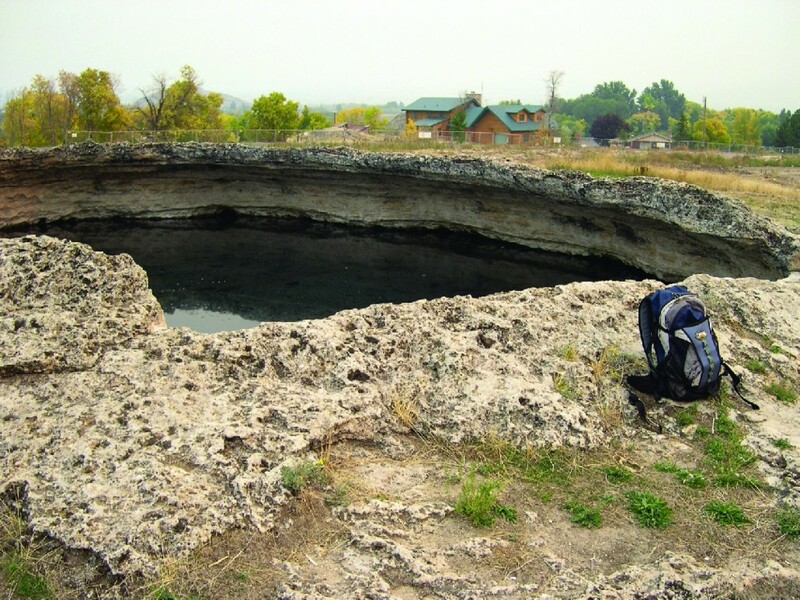 Thermal springs in and around the community of Midway in Wasatch County issue from several widespread, coalescing travertine mounds covering an area of several square kilometers. Temperatures in the springs generally range from 35° to 46°C (95 to 115°F). Thermal water at Midway probably originates from deep circulation of meteoric water from recharge zones located to the north near Park City. The Mountain Spa Resort, one of the oldest resorts in the state, uses thermal water for heating a swimming pool and for therapeutic baths. The thermal water flows at 43°C (110°F) and comes from 25 hot springs and two wells. The Homestead Resort, a hotel and resort complex, uses thermal water in a therapeutic bath, and also offers guests scuba diving within a 35°C (95°F) thermal pool inside the Homestead Crater, a large travertine mound. 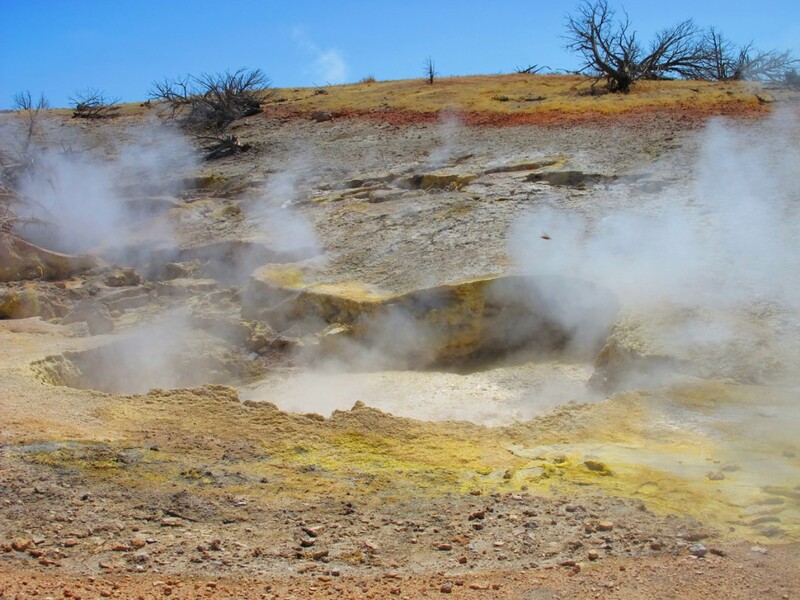 The Monroe-Red Hill Hot Spring area is 16 km (10 mi) south of Richfield in Sevier County. The springs issue at about 77°C (170°F) near the surface trace of the Sevier fault adjacent to the Sevier Plateau. The Mystic Hot Springs resort offers a geothermal-heated swimming pool, therapeutic baths, camping facilities, and tropical fish ponds. 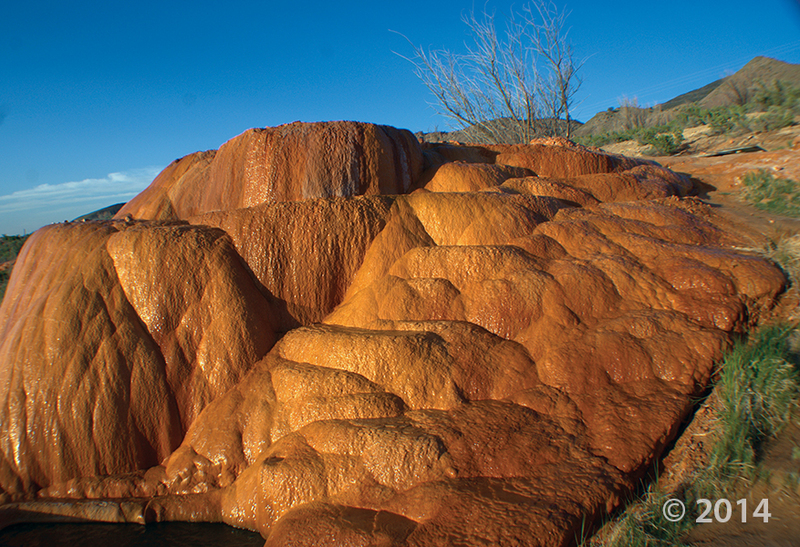 The geothermal water flows from travertine mounds behind the Mystic Hot Springs resort. Visitors can soak in bathtubs set in the travertine deposits, or in a travertine soaking pool. The area was the focus of U.S. Department of Energy-sponsored geothermal studies in the late 1970s. 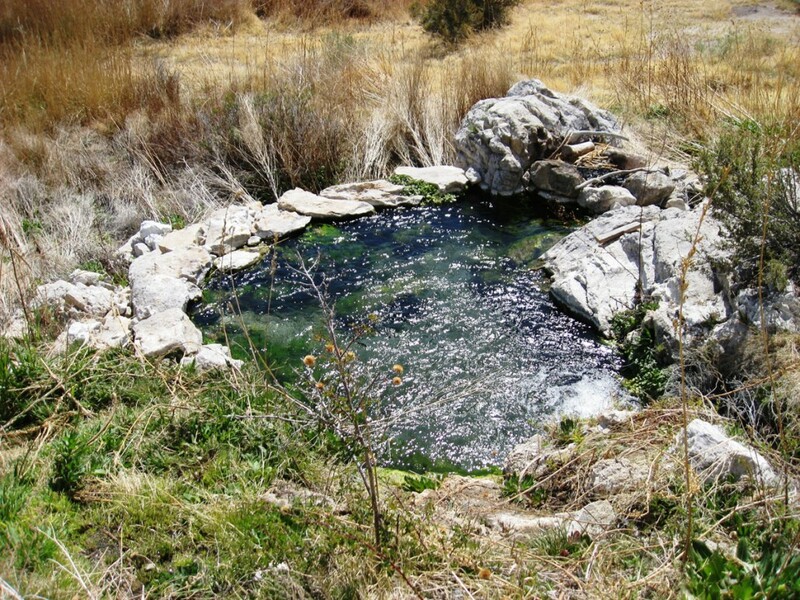 Veyo Hot Spring is located southeast of the town of Veyo along the Santa Clara River. Here the river has incised 1 and 2 million-year-old basalt flows to form a steep-walled canyon. The Veyo Pool resort offers swimming and therapeutic baths with spring flows channeled to the swimming pool at a temperature of about 32°C (89°F). The resort also operates the Crawdad Canyon Rock Climbing Park. Pah Tempe Hot Springs, also known as La Verkin or Dixie Hot Springs, are located along the Virgin River near where the river cuts through Timpoweap Canyon along the Hurricane Cliffs between the towns of Hurricane and La Verkin. The springs issue at about 42°C (108°F) from multiple vents in fractured limestone. Widespread basalt flows ranging in age from 2 million years to 1,000 years old lie in the vicinity of the springs, possibly relating to local heat sources for the thermal water. At the Pah Tempe Mineral Hot Springs resort (temporarily closed) the thermal water is channeled into a swimming pool and therapeutic baths. Hi-Tech Fisheries, a contract operator for Utah Correctional Industries, operates commercial tropical fish facilities near Crystal Pond, the largest of several ponds fed by Crystal Hot Springs. Discharge water from Bluffdale Flower Growers and the prison geothermal facility is used by Hi-Tech Fisheries. Crystal Springs Fisheries, another tropical fish facility, also uses the geothermal waters near the Utah State Prison. Approximately half a million cichlids (tropical fish from Africa) are raised annually. For more information on these springs, see greenhouses and space heating. The former owners of the resort operated the Belmont Springs Hatchery, a commercial aquaculture facility raising lobsters and crayfish for distribution out of the local area. The current managers are considering raising bass and tropical fish. For more information on these springs, see resorts. At Mystic Hot Springs resort six tropical fish ponds are keep at 24°C (75°F) year around, where Koi, Mollies, African cichlids, and fancy guppies are raised for the pet store market. Water drains from the pool inside the Homestead Crater into a fish pond adjacent to the Homestead Resort, where Koi fish are raised. For more information on the Midway springs, see resorts. Geothermal water from one 107 m (350 ft) well is used to heat a LDS (The Church of Jesus Christ of Latter-day Saints) ward house in the town of Newcastle. The system reportedly uses a down-hole heat exchanger and closed-loop circulation. For more information on the Newcastle area, see greenhouses. The geothermal heating system for the Utah State Prison came back on-line in January 2004, after being shut down for nearly 20 years, mainly due to calcite scaling. Johnson Controls, Inc., an energy-service company, entered into a long-term agreement with the Utah Department of Corrections to provide heat to the minimum-security wing of the prison. Johnson re-engineered and rebuilt the heating system to eliminate the past scaling problems, and provide space and water heating to the complex. Johnson completed additions to the prison project in 2005, and the geothermal heating system currently supplies heat and domestic hot water for 30,906 m2 (332,665 ft2) of the prison (including five large buildings housing 1460 inmate beds). The spent geothermal fluid is cooled and cascaded to an aquaculture facility (tropical fish rearing) located about 0.8 km (0.5 mi) to the west and operated by Hi-Tech Fisheries. 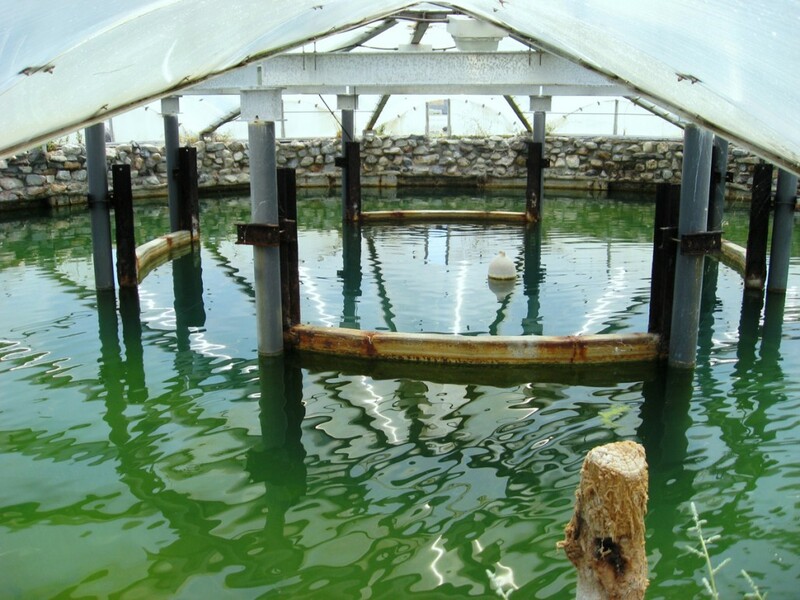 For more information on these springs, see greenhouses and aquaculture. Is there winter scuba diving in Utah?